OK, only a fool uses a term like “Always.”But this is one of those cases where I feel pretty comfortable giving advice to those commercial DIRECTV installers out there. It’s easy to forget that commercial installations for DIRECTV Satellite are different from residential ones. The goal with a residential customer is to keep the wiring to a minimum, keep the impact to the customer low. Make it simple, and keep it simple. That’s why you have to use equipment that’s easy to upgrade. Don’t even think about a SWM-enabled LNB. Today’s SWM-enabled LNBs support either 8 or 13 tuners in commercial installs. That may be enough for your customer now, but will it be enough forever? I’ve seen too many cases when a customer wants to upgrade past that point and the entire installation needs to be redone. There’s no way to expand that single wire LNB to add additional capacity. Instead, use the Reverse Band Legacy LNB for all commercial installs. Will a 4-wire LNB work as well? Yeah, you might be tempted to use an older 4-wire LNB. After all, copper wire is expensive and most customers don’t want bigger holes in their walls. But, I’m asking you to think twice before you do it. It’s true that the current DIRECTV boxes don’t need that fifth and sixth wires. They’re only for 4K, which is still pretty rare in commercial installations. The problem is that you don’t know what the future will bring. More bars and restaurants are moving away from individual receivers toward COM3000 systems. The COM3000 acts as an all-in-one receiver solution and makes video distribution easier. It also comes with an app that takes the place of a fancy matrix switch. 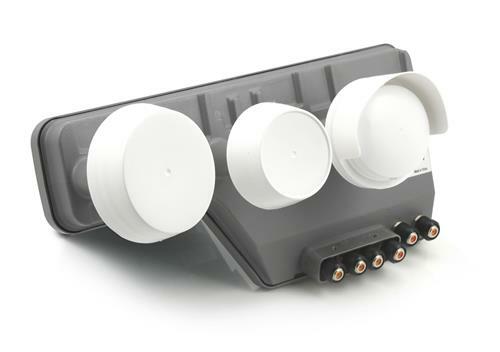 If you’re going COM3000, you’ll want that six-wire LNB. Why? Because COM3000 can give 4K to every TV in the bar. That’s what bar owners are asking for. It may be a tough sell for the customer. I know you fight on price. A system with a separate multiswitch is more expensive. More copper is more expensive. You don’t want to lose the sale. I’m with you, really I am. Try to explain that this is an installation for the long run, and it should be done right from the beginning. Make sure that you explain how much more money it will take to do it right later. In order to add that extra receiver, you’ll end up rewiring everything and taking the TV offline for hours or even days. Maybe you’ll get through to that business owner. When it comes to DIRECTV supplies, you need someone who has all the stuff you need, in stock. No one has a better stock than Solid Signal, from connectors and ground screws all the way to headend systems. You don’t need to order from anyone else, and if you need help, your friends are always ready to help. Give us a call at 877.312.4547! Join us at the 2018 Marine Conference and Expo! Will Dodgers fans ever be able to watch on DIRECTV?